Eva Bartlett breaks down the dizzying array of information surrounding the mounting humanitarian crisis in Syria’s Eastern Ghouta. With accusations abound, parsing the reality on the ground is becoming more challenging by the day. The “statement” — consisting of blank lines with the preface “No words will do justice to the children killed, their mothers, their fathers and their loved ones” — dovetails with corporate media’s increasingly hysterical rhetoric on the Damascus suburb of Ghouta, which has been plagued with chemical weapons attacks for over four years, perpetrated by U.S.-backed proxies allied with the Nusra Front attempting to frame the Syrian government with war crimes. Where was UNICEF’s dramatic blank-lined protest when 200 civilians, including 116 children, were slaughtered by terrorist factions while in convoy from Kafraya and Foua in April 2017? These factions included Ahrar al-Sham (supported by Turkey and Saudi Arabia), al-Nusra (al-Qaeda), and factions of the Free Syrian Army. The Free Syrian Army was armed by the U.S. And, according to the words of former Qatari Prime Minister Hamad bin Jassim bin Jaber al-Thani, Qatar — with the support and coordination of Saudi Arabia, Turkey, and the U.S.—was from the beginning supporting armed groups, even al-Qaeda, in Syria. This seemingly outraged UN statement has made the rounds in corporate media reports on eastern Ghouta, most of which cite the U.K.-based Syrian Observatory for Human Rights (SOHR), run from his home by a sole person, Osama Suleiman, who uses the pseudonym Rami Abdul Rahman. In its recent Ghouta reports, SOHR itself does not provide sources. Not once did he mention the designated terrorist factions within. These terrorist factions include: Jaysh al-Islam (Saudi-backed), Hayat Tahrir al-Sham (al-Qaeda), Ahrar al-Sham, and Faylaq al-Rahman (the main faction in Jobar, and reported to have received BGM-71 TOW anti-tank guided missiles). The UN would garner much less public support and outrage if, instead of easily-misconstrued emotive statements, it showed training videos like this one depicting then-leader Zahran Alloush’s Army of Islam training in eastern Ghouta with their armored tanks. This is the reality of eastern Ghouta. Jaysh al-Islam is the group infamous for caging civilians, including women, to use as human shields. The UN would garner less support still were the UN and corporate media to show videos of civilians like this woman cursing the armed groups, blaming them for hunger and for hoarding food, telling them to leave Ghouta. With hindsight, we know now that in other formerly-occupied areas of Syria, like East Aleppo, Homs, Madaya, al-Waer, and elsewhere, when finally resecured from terrorist factions, civilians in these areas spoke of terrorists hoarding food and medicine, and preventing them from leaving — holding them hostage as human shields. Why reportedly? Why did Lowcock not take and read the testimonies of civilians as he claims to have done of civilians in eastern Ghouta? Damascus is far more accessible than al-Qaeda-occupied Ghouta: Lowcock could very easily travel to the Syrian capital and meet with some of the many civilians affected by the years of constant mortaring from terrorist factions in eastern Ghouta. Instead, he seems to prefer to repeat testimonies collected from afar, solely from and on Ghouta. For weeks, Jaysh al-Islam, al-Qaeda, Ahrar al-Sham, and Faylaq al-Rahman have intensified their heavy-shelling of Damascus, intentionally targeting heavily-populated civilian areas of the city, including schools, homes, and crowded public spaces. Jaysh al-Islam — whose political leader, Mohammed Alloush, was supposed to participate in the May and subsequent 2017 Astana peace talks — is one of the factions attacking Damascus. The Syrian website Muraselon reported that the February 23 bombing of Damascus, which killed at least one civilian, was a powerful missile, likely fired by Jaysh al-Islam. The article referred to the terrorist group’s own social media bragging about possessing and intending to fire said missile on Damascus. That deserves a little outrage and more than a passing comment. We have an official letter from the Resident Coordinator in Damascus, the chair of OCHA in Syria, saying that during 2017, OCHA — with the cooperation of the Syrian government, and Syrian Red Crescent, and International Committee of the Red Cross — have provided humanitarian assistance to 2.3 million people. Regarding the heavy shelling of Damascus that Mr. Lowcock stated is reportedly happening, at a Security Council meeting one week prior, Ambassador al-Ja’afari cited the over 1,000 shells from eastern Ghouta that had targeted Damascus. On February 22, al-Ja’afari stated that the number of shells on Damascus was now over 1,200, noting that 8 million people in Damascus were at risk. February 21: “A woman was killed on Wednesday while 22 persons were injured in fresh attacks by armed groups on different Syrian regions.” Dozens of shells. The February 23 shelling of Damascus killed a Syrian doctor: Dr. Hassan Haj Hassan, an anesthesiologist and a professor at the Institute of Health Technology in Damascus. He was killed by #EGhouta terrorist shelling of Damascus. In his latest address at the UN Security Council, Ambassador al-Ja’afari noted that the main headquarters of the Red Crescent in Syria, based in Damascus, was targeted with 10 missiles, originating from Ghouta. In January, 2014, at the Geneva II conference on Syria in Montreux, Switzerland, Foreign Affairs Minister Walid Muallem was himself cut off by none other than the Secretary-General, Ban Ki-moon. A screenshot from a 2017 video released by the Saudi-backed terror group Jaysh al-Islam, shows Jaysh al-Islam fighters operating in Eastern Ghouta. 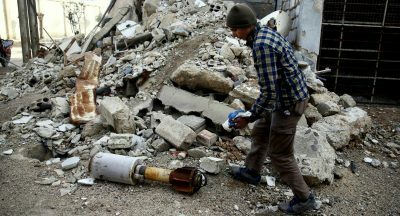 The UN’s Lowcock humanized the suffering in eastern Ghouta, and it cannot be denied there is suffering there, where the aforementioned terrorist groups embed in civilian areas only to hold civilians hostage, and are the cause of the military siege and targeted strikes on Ghouta. Yet, he and the media mentioned only in passing, and skeptically, the relentless shelling of civilian areas of Damascus and the surrounding countryside, dehumanizing the civilians of Damascus — just as corporate media dehumanized the civilians of Aleppo, then under the relentless bombings and sniping of al-Qaeda and other terrorists’ occupying the city’s eastern areas. In Aleppo in November 2016, the head of forensics, Dr. Zaher Hajjo, told me (on a day of intense terrorist bombings that killed 18 civilians and injured over 200) that in the past five years 10,750 civilians had been killed in Aleppo, 40 percent of whom were women and children. He said that in the past year alone, 328 children had been killed by terrorist shelling in Aleppo, 45 children killed by terrorist snipers. In February 2015, I visited Damascus’ University Hospital, documenting just some of the children maimed and critically injured by such terrorist attacks — and, a year prior wrote about my own experiences in the intense shelling of Damascus, where I stayed several weeks — and, since then, have met victims of terrorist shelling of Old Damascus. With access to numerous sources on these incessant and deadly mortar and rocket attacks and the Syrian ambassador’s repeated statements on this at the UN, the United Nations nevertheless chooses to obfuscate on the intensified shelling of civilian areas of Damascus and elsewhere in Syria, and instead endorse the war propagandists. On February 22, UNICEF tweeted a New York Times article featuring “media activist” Firas Abdullah. Abdullah is not the neutral media source portrayed. Following the December 2015 killing of terrorist Zahran Alloush, then-leader of Jaysh al-Islam, Abdullah posted his eulogy for Alloush, calling him a “beautiful martyr.” This is the person whom the Times chose to portray a human face of Ghouta, retweeted by UNICEF. Also on February 22, the UN body tweeted a CNN report citing the SOHR, and of course the UNICEF blank statement of outrage, in the cyclic fashion that is typical of regime-change war propaganda reinforcing itself. On February 21, UNICEF tweeted a Newsweek photo slideshow titled after UNICEF’s own blank statement of outrage. Their February 19 tweet links to an article on the Bana al-Abed of Ghouta, Muhammad Najem, whose Twitter account began in December 2017 and has nearly 5,000 followers. Expect that number to skyrocket. Expect a memoir to follow. A UNICEF February 19 tweet on Ghouta links to war propagandist Louisa Loveluck’s article, reporting from Beirut, Lebanon. If it isn’t already clear, UNICEF is participating in war propaganda against Syria, reporting and endorsing one very exaggerated and not substantiated side of the story, disappearing another very real side. In January 2016, I wrote of OCHA’s selective tweeting around the terrorist-occupied village of Madaya, obfuscating the terrorist-besieged Idlib villages of Foua and Kafraya. Honest reporters like Murad Gazdiev entered Madaya in January 2016 and confirmed that food and medical aid had indeed entered. He spoke with residents who complained of the armed groups stealing this food. When I went to Madaya in June 2017, I spoke with civilians there who stated that vast amounts of food and medical aid entered the area, but they had no access to it, as Ahrar al-Sham, al-Nusra and co-extremists holding the village hoarded the food and sold it at extortionist prices. I also saw prisons use to hold, and sometimes torture, civilians before their trials in terrorists’ courts. I also saw these in eastern Aleppo and in al-Layramoun, in the city’s northwest. When eastern Ghouta is finally secured, it won’t be surprising to learn that schools, hospitals, and/or homes were turned into prisons to hold the civilians for whom the UN and corporate media feign concern. According to UNICEF, the current executive director, Henrietta H. Fore, was formerly Administrator of USAID, Chief Operating Officer for the U.S. Department of State, and Director of the United States Mint in the U.S. Department of Treasury. The prior UNICEF executive director, Anthony Lake, was national security advisor to President Clinton, and was nominated to be the director of the CIA. In Yemen, the UN is suspected of having smuggled in two CIA agents, as reported in 2015 by journalist Nizar Abboud, and surprisingly in 2017 by The New York Times. UNICEF executive directors who formerly worked for USAID, the U.S. State Department, even Director of the United States Mint in the U.S. Department of Treasury: it seems that UNICEF’s role is less about humanitarian aid and more about being the humanitarian propaganda arm of Washington. We should, indeed, feel sorrow for any civilian casualties in the U.S./U.K. and allies’ war on Syria. However, after years of the most egregious war propaganda on Syria, we should also exercise caution about the latest stories, be they from unsourced SOHR reports or the UN itself. Remember, Omran Daqneesh was once depicted widely as the face of Syrian suffering. As it turned out, the entire story Western media and agencies told was false, based on unreliable sources. Recall that the humanitarian agency MSF once insisted that Syrian or Russian airstrikes had destroyed — reduced “to rubble” — a hospital that MSF supported. This turned out to be utterly false. Unlike MSF, unlike the most of journalists who reported lies around Omran Daqneesh, I did go to see the intact Quds hospital, and met Omran and his father, who told me everything the media had reported on his son was false; the media had exploited his boy. Both MSF and corporate media lied about these stories, and their lies were used to call for further Western intervention in Syria. Entering its 32nd day, the Turkish aggression continues to claim more civilian casualties and causing material damage to properties. The UN has yet to issue an updated statement of concern regarding the latest Turkish bombings of Afrin. However, he didn’t mean the killing of hundreds (a lower estimate) or even thousands of Syrian civilians by the U.S.-led coalition, illegal in Syria — the latest being 12 civilians, “mostly women and children,” killed in residential neighborhoods in Hajin town in Deir Ezzor eastern countryside on February 21. But this is precisely what Syrian officials have been attempting to do, with offers of amnesty, safe transport of out of Ghouta, and the provision of medical and food aid. As with Aleppo, a humanitarian corridor has been established to enable eastern Ghouta residents to leave the district. However, given that terrorists repeatedly shelled humanitarian corridors in Aleppo (including a corridor road I stood on in November 2016), holding civilians hostage, it is quite likely terrorists in eastern Ghouta will do the same. These are the types of actions the UN should be focused on and supporting, not repeating war propaganda that only confuses and prolongs the fight for peace. Eva Bartlett is a Canadian independent journalist and activist. She has spent years on the ground covering conflict zones in the Middle East, especially in Syria and Palestine. She is a recipient of the International Journalism Award for International Reporting, Mexican Press Club, 2017. Visit her personal blog, In Gaza, and support her work on Patreon. – في كلّ مرة كان يصدر قرار أممي لوقف النار منذ بداية الحرب على سورية كان واضحاً أنه إجهاض لمشروع حسم كان يقترب لصالح الجيش السوري، وأنّ القبول به من سورية وحلفائها كان لتفادي الأسوأ، وهو مخاطر تدخل غربي مباشر وتصعيد عسكري تدخل فيه قوى إقليمية ودولية، لم يكن ما ظهر منها في آب 2013 بحشد الأساطيل الأميركية قبالة سورية مجرد مسرحية ولا مناورة. وفي كلّ مرة كان يصدر قرار أممي بوقف النار كان يتوزّع جهد الجيش السوري على عشرات الجبهات، وضعف الحضور العسكري للحلفاء يفرض عليه حساب توزيع قدراته بطريقة مجدية وتقبل التهدئة على جبهة والتفرّغ لسواها. وفي كلّ مرة كان يجري صدور قرار أممي بوقف النار كان يثبت أنّ مضمونه توفير فرصة الاستعداد للجماعات المسلحة لجولة جديدة أشدً خطراً. – منذ التموضع العسكري الروسي في سورية نهاية العام 2015، وانكسار خطر التدخل الأميركي الواسع منذ عام 2013 وعجز إدارة دونالد ترامب عن تخطي هذا العجز، تبدّلت المعادلة الدولية وزالت مخاطر كانت في الحسبان. ومنذ تموضع الآلاف من المقاتلين من الحلفاء واستنهاض الشعب السوري لضخّ عشرات الآلاف من المقاتلين ضمن قوات رديفة للجيش، وتأثير الانتصارات المتلاحقة على منح الجيش السوري مقدرات معنوية وبشرية ومادية جعلت منه صاحب اليد العليا في كلّ المعارك العسكرية، وصولاً لتدحرج الانتصارات لحساب الجيش السوري وحلفائه، وما نتج عنه من تراجع عدد جبهات القتال وقدرة الجيش والحلفاء على إدارة ما بقي منها. – منذ معركة حلب ونحن نشهد ثباتاً سياسياً روسياً في مجلس الأمن، وتحمّلاً استثنائياً للضغوط والحملات، لمنع أيّ وقف للنار يؤدّي الغرض الذي كان مرسوماً لكلً هدنة، ليأتي القبول بالنص المعدّل للقرار الأخير ويحمل تعبيراً عن التوازنات الجديدة، فترضاه سورية وتصوّت عليه روسيا. فللمرة الأولى يأتي القرار الأممي ليربط فك الحصار بفك حصار موازٍ في كفريا والفوعة، ويربط وقف النار في الغوطة بوقف شامل في كلّ سورية فيضمّ الأتراك والأميركيين والإسرائيليين لموجباته، ويمنح سورية وحلفاءها اعتبار أيّ خرق تركي أميركي إسرائيلي سقوطاً للقرار، كما يمنح سورية ربط إجراءات المعونات والإخلاء والتهدئة بمثلها في الفوعة وكفريا وعفرين، والأهمّ أنه بوضوح يستثني النصرة وداعش ومَن معهما، ما يعني مواصلة حرب ضرب النصرة في إدلب والغوطة، وضرب داعش شمال دير الزور، وهذا ما قاله عملياً السفير السوري في نيويورك بشار الجعفري تعقيباً على القرار وشرحاً للفهم السوري لتطبيقه، مضيفاً تهديداً لواشنطن رداً على تهديد مندوبتها لسورية، لوضع النقاط على الحروف في كون القرار تعبيراً عن توازنات جديدة لم يعُد ما كان صالحاً بالأمس صالحاً لليوم. – لم ينتظر الجيش السوري والحلفاء مفاوضات ترسم آليات تطبيق القرار، بل بدأ بالتطبيق وفقاً لمفهومه للقرار بالتقدّم على محاور انتشار جبهة النصرة في الغوطة، ليحقق إنجازات مهمة في شمالها تمثلت بالسيطرة على مساحات واسعة وتلال هامة وصولاً للسيطرة على بلدتي الصالحية والنشابية جنوب شرق الغوطة الشرقية، والتقدم على محاور حزرتا وجوبر، وهذا ليس إلا اليوم الأول، ويبقى الكلام الفصل لما هو آتٍ، ومعادلة كلّ قذيفة تسقط على دمشق تعني سقوط الالتزام بوقف النار. The following are segments taken from an outstanding Haaretz commentary titled ‘The Crumbling Consensus that Jews Were the Ultimate Holocaust Victims’ by Ofri Ilani. The article explores the fundamentals of the global religion of the Holocaust, identifies the international institutions that sustain the doctrine and the political events that indicate that the Goyin are weary of the notion of the primacy of Jewish suffering. I tend to agree with most of Ilani’s observations as well as his predictions regarding the fate of the holocaust religion. One crucial difference between us is that while Ilani seems distressed by the possible collapse of the Holocaust consensus, I believe that emancipation from that tyrannical Judeo-centric precept is a necessary humanist development. Ilani’s view seems to integrate the Holocaust into the Greek’s ‘Classical Elements’ along side water, air and fire. Ilani elaborates on his position. Ilani is clearly younger than I. For my parents’ generation, my peers and myself, the Holocaust was a distant story: a Jewish diaspora tale, a tragic event that happened to other people: people whom we saw as categorically foreign. People who were led like lambs to the slaughter as we, ‘the Israelis’ were not. Clearly at a certain stage the Israeli attitude toward the Holocaust changed and this shift has yet to be completely understood. Ilani then affirms that the Holocaust religion dictates a strict and rigid world order. Ilani is simply stating what many of us know. The primacy of Jewish suffering has become a tyrannical apparatus in the West. Within the holocaust ideology, Israel is shielded from criticism and its extensive record of human rights abuse is largely ignored. The Palestinian solidarity movement is practically paralysed by Jewish thought police squads, because within the context of the primacy of Jewish suffering, Palestinians can only be secondary victims. Ilany describes how the Holocaust story, as we now know it, is starting to crumble. The Israeli academic acknowledges that the Holocaust and the new global capitalist world order are two sides of the same coin. I guess that those who are upset by the global capitalist order might be cheered by Ilani’s vision of the crumbling Holocaust creed and the authoritarian institutions attached to it. If they want to burn my books , you want to read them..
الأمر بسيط، عليك التوجه من هنا إلى فندق آخر حيث يقيم شمعون بيريز. اجلس وتفاهم معه، وعندما تعود، أُبلغك بموعدك في البيت الأبيض. مرّت سنوات طويلة على هذه الحادثة وحصلت تطورات كثيرة، لكن القاعدة النظرية لضمان حماية النظام القطري لا تزال هي نفسها. وعندما قررت السعودية والإمارات ومصر عزل قطر قبل مدة، سارعت الدوحة إلى العنوان المناسب: الولايات المتحدة وإسرائيل! التوتر القطري الناجم عن الحصار المفروض عليها من قبل دول خليجية وعربية، دفعها إلى القيام بخطوات سياسية كثيرة، من بينها العمل على تطوير العلاقات مع روسيا وإيران وتركيا، وإعادة الحرارة إلى هواتف توصلها بحكومات وقوى وشخصيات متنوعة في العالم العربي، مبدية استعدادها لفتح صفحة جديدة مقابل الحصول على دعم هذه الجهات في مواجهتها الحصار. وفي هذا السياق أبدى القطريون الاستعداد للقيام بتغيير العديد من سياساتهم في المنطقة، بما في ذلك، وتحديداً، في ملفات سوريا والعراق واليمن، وأن يلعبوا دوراً سمّته الدبلوماسية القطرية «احتواء الإخوان المسلمين». في الملف العراقي، اكتشف القطريون أنّ السعودية لا تترك مجالاً لأحد، وأن تورط الولايات المتحدة الاميركية في إرسال جنودها من جديد إلى هناك لا يوسع هامش المناورة أمام الدوحة. وجاءت قصة احتجاز أفراد من العائلة الحاكمة إلى جانب قطريين آخرين في العراق، والتسوية التي قضت بإطلاقهم، لتخفّفا من دعم المجموعات الارهابية المقاتلة للدولة العراقية. لكن الأمر لم ينسحب على الدعم الاعلامي والسياسي المستمرين، بما في ذلك دعم أنصار النظام العراقي السابق، وبعض القيادات الاسلامية القريبة من تنظيم «القاعدة». في سوريا، تعرضت المجموعات المدعومة من قطر لضربات كبيرة في الميدان. والمجموعات السياسية الخاضعة لسلطة قطر، تعرّضت بدورها لحصار نتيجة عدم فعاليتها، بينما تولّت السعودية سحب قسم منها باتجاهها. لكن قطر ظلت، وبإشراف تركي، تقدم الدعم المالي للمجموعات الارهابية، وخصوصاً في الشمال السوري، ولا سيما منها «جبهة النصرة»، والتي لا تزال حتى اليوم تملك نفوذا كبيراً داخل قياداتها الدينية والميدانية، رغم أنّ الدوحة أبلغت الجميع أنها في صدد وقف الاتصالات مع هذا التنظيم، وأنها لن تشارك في أي وساطات جديدة، بما في ذلك «اعتذارها» عن المساهمة في الوساطات التي قامت على إثر الضربات التي وجهت إلى «جبهة النصرة» على الحدود اللبنانية ــ السورية، علماً بأن قطر لم توقف دعمها الاعلامي والسياسي للمجموعات المسلحة السورية، وهي لا تزال تقود أوسع حملة بالتعاون مع الاميركيين والفرنسيين لمنع أي تواصل مع الحكومة السورية. في اليمن، تصرفت قطر على أنها «تحررت» من الورطة السعودية. لكن موقفها الفعلي لم يكن ــ وليس هو الآن ــ ضد العدوان وضد الجرائم اليومية بحق الشعب اليمني، وكل ما في الأمر أنّ الدوحة تريد منافسة الرياض وأبو ظبي على النفوذ في البلد المنكوب، ولديها جماعاتها هناك، ولا سيما المجموعات المتصلة بالإخوان المسلمين (حزب الإصلاح) وبعض القيادات القومية العربية ومجموعات سلفية. وهي عندما ترفع الصوت ــ إعلامياً ــ لا تُقدم على أي خطوة عملية في اتجاه وقف حمام الدم في اليمن. بل حتى عندما يتطرق الأمر إلى مفاوضات جانبية، تظهر قطر التزاماً كاملاً بالتوجّهين الأميركي والبريطاني في ما خصّ المفاوضات مع «أنصار الله» حول مستقبل اليمن. وهذا ما يتضح أن قطر تقوم به، سواء من خلال برامج التعاون القائمة بواسطة موفدها إلى غزة السفير محمد العمادي، الذي يفاخر بعلاقاته الإسرائيلية وبلياليه الحمراء في تل أبيب ولقاءاته المفتوحة مع القيادات السياسية والأمنية الإسرائيلية، أو من خلال ممارسة أبشع عملية ابتزاز بحق الفلسطينيين في قطاع غزة، لجهة المحاولات المستمرة لمقايضة برنامج الدعم للإعمار بالحصول من الجانب الفلسطيني على تنازلات تخصّ ملف الصراع مع إسرائيل. مع التذكير بأنّ قطر روّجت، ولا تزال، لفكرة تقول إن فشل مساعي التسوية السياسية يرافقه فشل في برنامج المقاومة. وهي فكرة تستهدف الدخول إلى العقل الجمعي للفلسطينيين وتثبيت أن الأكل والشرب أولوية لا تسبقها أيّ أولوية، بما في ذلك معركة الاستقلال. ما يصل من غزة، وبقية فلسطين، عمّا تقوم به قطر، من خلال مندوبها، لا يبشّر بالخير، ويؤكد مرة جديدة أن كل ما تقوم به «فقاعة الغاز» لا يعدو كونه منافسة للإمارات والسعودية على كسب ودّ الولايات المتحدة وإسرائيل. 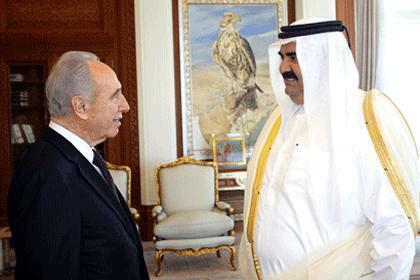 والمشكلة هنا ليست مع قطر نفسها، بل مع من لا يزال من الفلسطينيين أو العرب يثق بأنها تقف فعلياً إلى جانب الحق العربي في التحرر من الاحتلال ومن التبعية للغرب الاستعماري… إنه زمن الوقاحة القطرية! 1) UN Resolutions do not subscribe to the all-or-none approach; they specify obligations to each party separately. Passing thoughts on the willingness of the politicians and merchants of death who allow the unimaginable to become imaginable, allow financial gain to prevail over the lives of innocent children, and are more willing to protect guns at the expense of the lives of children. President Trump listened recently to the impassioned testimony of parents and children who have seen their children and friends killed in gun shootings. He responded by advocating that teachers be armed and trained to have concealed weapons. Instead of confronting the roots of violence in America, he followed the NRA line of addressing the issue of mass violence, shootings, and the ongoing carnage with a call to arm more people, putting more guns into play, and stating that violence can be met with more violence. This logic is breathtaking in its insanity, moral depravity, refusal to get to the root of the problem, and even advocate minor reforms such as banning assault rifles and high-capacity ammunition magazines, and expanding background checks. There are 300 million guns in the United States and since the mass murder at Sandy Hook Elementary School of 20 young children and 6 teachers a decade ago, 11,000 more children have died of gun violence. There is no defense for putting the policies of the NRA ahead of the lives of children. Criminal acts often pass for legislative policies. How else to explain the Florida legislature refusing to even debate outlawing assault weapons while students from Majory Stoneman Douglas High School sat in the galleys and watched this wretched and irresponsible act take place. How else to explain that the House of Representatives – reduced to an adjunct of the NRA – voted to pass the Concealed Carry Reciprocity Act (H.R.38) which would allow individuals to carry concealed weapons across state lines. These are the people who have the blood of thousands on their hands. The power of money in politics has morphed into a form of barbarism in which financial gain and power have become more important than protecting the lives of America’s children. I find it extremely difficult to watch the debates about gun violence on the mainstream media. The call for reform is so limited as to be useless. Instead of banning assault rifles, they celebrate Trump for suggesting that he raise the age to 21 in order for people to buy a weapon of war. Instead of preventing violence from engulfing the country and schools, he calls for arming teachers and the press celebrates his willingness to entertain this issue. Instead of speaking about justice and allowing people to speak who are against deregulating laws restricting or abolishing the merchants of death, the media allows an NRA hawk to speak at the town meeting and rather than calling her out for being a spokesperson for violence rather than justice, they congratulate themselves on promoting balance. The corporate media has become a normalizing force for violence because they lack the courage to challenge the corporations that control them. They also benefit by peddling extreme violence as a spectacle. They refuse to begin with the issue of money in politics and start instead with what one parent called non-starters. Guns disappear from the conversation and appeals to fear and security take over. Young people have to lead this conversation and move beyond the mainstream media. And when they do appear they have to flip the script and ask the questions they think are important. Children no longer have a safe space in America, a country saturated in violence as a spectacle, sport, and deadly acts of domestic terrorism. Any defense for the proliferation of guns, especially those designed for war, is criminal. This is the discourse of political corruption, a government in the hands of the gun lobbies, and a country that trades in violence at every turn in order to accrue profits at the expense of the lives of innocent children. This debate is not simply about gun violence, it is about the rule of capital and how the architects of violence accrue enough power to turn machineries of death and destruction into profits while selling violence as a commodity. Violence is both a source of profits and a cherished national ideal. It is also the defining feature of a toxic masculinity. Gun reform is no substitute for real justice and the necessary abolition of a death-dealing and cruel economic and political system that is the antithesis of democracy. What are we to make of a society in which young children have a greater sense of moral courage and social responsibility than the zombie adults who make the laws that fail to invest in and protect the lives of present and future generations. First step, expose their lies, make their faces public, use the new media to organize across state lines, and work like hell to vote them out of office in 2018. Hold these ruthless walking dead responsible and then banish them to the gutter where they belong. At the same time, imagine and fight for not a reform of American society but a restructuring along the lines of a democratic socialist order.